An L-1 Visa is a practical way for a foreign company to expand to the United States. An L-1 visa allows the temporary transfer of an employee in an executive or managerial capacity or with specialized knowledge to work or establish an office in the United States. The United States Citizenship and Immigration Services (“USCIS”) highly scrutinizes L-1 Visa applications to ensure that an employer using the L-1 classification to transfer an employee to the United States will actually place that employee in a role that is primarily managerial, executive, or requiring specialized knowledge. As a result, it is imperative to consult an experienced attorney when preparing an L-1 Visa application. Such situations require obtaining a temporary worker visa for each employee. When seeking such a visa, it is important to understand what you are seeking and to be prepared for potential complications. If you are employed at a company overseas and your employer is seeking to use the L-1 visa classification to move you to a U.S. office, you need to ensure that you work with a specialized and experienced immigration attorney. The L-1A Visa process for transferees into executive or managerial roles is complex and requires extensive evidence of business practice, transactions, and employee qualifications. Failure to provide the proper documentation can significantly delay a visa petition or lead to a denial. 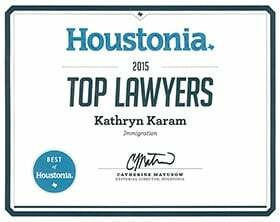 Kathryn Karam is a Board Certified Immigration Attorney with over five years of experience in assisting foreign employers obtain L-1A Visas for their executive and managerial employees. What are the eligibility requirements to apply for an L-1A Visa? What is considered "doing business"? What is a blanket petition? What evidence must be provided to USCIS? USCIS has specific eligibility requirements that each foreign employer and employee must fulfill when applying for an L-1A Visa. Second, the petitioning U.S. employer and foreign entity must be doing business as an employer in the U.S. and in at least one foreign country through the qualifying organization for the duration of the L-1A Visa employee’s stay in the U.S. If the U.S. employer has been doing business in the United States for less than one year, the petition will be considered a “New Office” L-1 Petition. Third, the employee must be in a managerial or executive capacity. A managerial capacity refers to the employee’s ability to supervise and control the work of professional employees and manage a department or organization. In some circumstances, a managerial capacity may refer to management of a specific function within the company. An executive capacity generally refers to an employee’s ability to make decisions on behalf of the organization without oversight. The determination of whether an employee is considered managerial or executive is fact-intensive. USCIS will investigate the education, duties, and functions of the employee. It will also consider the total number of employees at the company and the company’s ability to pay the wage promised to the L-1A Beneficiary. It is not sufficient for the employee to have an executive or managerial title without the corresponding skills, responsibilities and organizational structure. Finally, the employee must have been employed as a manager, executive, or employee with specialized knowledge for one continuous year in the three years preceding the filing of the L-1A Visa petition. Once the petitioning employer and employee satisfy all the eligibility requirements, the employer files the L-1 Visa petition with supporting documentation and applicable fees. The petition may be an individual L-1 petition or L-1 blanket petition. If the petition is an individual L-1 petition, it is filed with USCIS. Once USCIS approves the petition, the L-1A visa is valid for three years. If the petition is blanket L-1 petition, it is submitted directly to the Embassy or Consulate where the employee is stationed for approval and issuance of the L-1 visa. The employee’s L-1A status may be extended for a total of up to seven years. To qualify for an L-1A visa it is required that both the U.S. entity and foreign company be doing business or operational both the United States and the foreign country in which the overseas entity is based or the foreign company must be planning to open a new office in the United States. Doing business is defined as regular, systematic, and continuous provision of goods and/or services by a qualifying organization and does not include the mere presence of an agent or office of the qualifying organization in the U.S. and abroad. It is not required that the U.S. or foreign company be engaged in international trade. Unless the L-1 petition is filed as a New Office L-1, the two entities must continuously fulfill the “doing business” requirement during the entire duration of the L-1A visa beneficiary’s stay in the U.S.
Certain employers may file a blanket petition for the company’s U.S. and overseas entities. A blanket petition, if approved, will allow the company to transfer employees more easily by establishing that the U.S. and foreign employers have the requisite relationship required for their employees to qualify for L-1 visas. In some circumstances, visas may be available to bring overseas employees to the United States begin a new office or branch in the Houston area. You must show you have secured the space required for the new office or branch and that the new U.S. entity has sufficient funds (or the foreign company has sufficient funds) to cover the business’s anticipated expenses for the first year of operation. Read more at our the New Office L-1 petition here. USCIS requires extensive evidence of the background of both the employee and employer. To prove the employer fulfills the eligibility requirements certain documentation must be provided. Proof of qualifying corporate relationship: The petitioning employer must prove common ownership of the U.S. and foreign company. Proof of at least one year of employment with the overseas company : The petitioning employer must prove the employee worked in an executive or managerial capacity continuously for one year in the three years prior to filing. The aforementioned list of documents is not exhaustive. It is highly recommended that you consult an experienced immigration attorney for assistance with preparing the L-1A visa petition. If you are an international employer seeking to transfer executive or managerial employees to the U.S. to work or establish a new office, an attorney with Karam Immigration Law can assist you navigate the complicated L1-A visa process. Call us today at (832) 582-0620 to schedule a consultation.